Researchers have developed a new non-invasive therapy to accelerate healing and treat wounds such as venous ulcers using a battery operated ultrasound patch. When the body has difficulty returning blood from the feet back to the heart, it causes complications such as venous ulcers. Venous ulcers are caused when blood backflows in the vein and blood starts to pool in the leg causing pressure which results in inflammation and formation of an ulcer. Current treatments for venous ulcers takes months and even years to heal. The most popular treatment is compression therapy. In compression therapy, the patient wears elastic socks which squeezes the leg to prevent the blood from flowing backwards. Researchers have discovered in human clinical trials, that by using an ultrasound patch combined with compression therapy, healing of the ulcers is accelerated. Initial studies show that 24 hours after undergoing a 15 minute ultrasound therapy, cell fibroblast metabolism increased by 32% and its proliferation went up by 40%. Fibroblasts are cells that are active in wound healing. The portable ultrasound patch just weighs around 100 grams and is powered by two rechargeable lithium ion batteries. They have noted that the most efficient dose for the therapy is a 20khz frequency for 15 minutes. 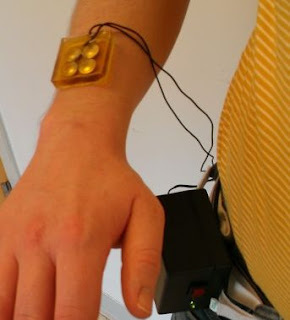 In a small clinical study, researchers administered a new method for treating chronic wounds using a novel ultrasound applicator that can be worn like a band-aid. The applicator delivers low-frequency, low-intensity ultrasound directly to wounds, and was found to significantly accelerate healing in five patients with venous ulcers. Venous ulcers are caused when valves in the veins malfunction, causing blood to pool in the leg instead of returning to the heart. This pooling, called venous stasis, can cause proteins and cells in the vein to leak into the surrounding tissue leading to inflammation and formation of an ulcer. The technology was developed by researchers at Drexel University, Philadelphia, with funding from the National Institute of Biomedical Imaging and Bioengineering (NIBIB), part of the National Institutes of Health. Venous ulcers account for 80 percent of all chronic wounds found on lower extremities and affect approximately 500,000 U.S. patients annually, a number that's expected to increase as obesity rates climb. It's estimated that treatment for venous ulcers costs the U.S. healthcare system over $1 billion dollars per year. Standard treatment for venous ulcers involves controlling swelling, taking care of the wound by keeping it moist, preventing infection, and compression therapy—a technique in which patients wear elastic socks that squeeze the leg to prevent blood from flowing backwards. Despite these measures, wounds often take months and occasionally years to heal. "Right now, we rely mostly on passive treatments," said Michael Weingarten, M.D., chief of vascular surgery at Drexel Medicine and a researcher in the study. "With the exception of expensive skin grafting surgeries, there are very few technologies that actively stimulate healing of these ulcers." In an article to be published in the Journal of the Acoustical Society of America, the Drexel researchers report that patients who received low-frequency, low-intensity ultrasound treatment during their weekly check-up (in addition to standard compression therapy), showed a net reduction in wound size after just four weeks. In contrast, patients who didn't receive ultrasound treatment had an average increase in wound size during the same time period. "There have been studies on the therapeutic benefits of ultrasound for wound healing, but most of the previous research was performed at much higher frequencies, around 1-3 megahertz (MHz)," said Peter A. Lewin, Ph.D., Richard B. Beard Professor of Biomedical Engineering at Drexel, and the primary investigator on this project. "We had an idea that if we went down to the range of 20 to 100 kilohertz (kHz), which is at least an order of magnitude lower, we might see more profound changes; that's exactly what happened." In order to determine the optimal ultrasound frequency as well as treatment duration, the researchers treated patients with either 15 minutes of 20 kHz ultrasound, 45 minutes of 20 kHz ultrasound, 15 minutes of 100 kHz ultrasound, or 15 minutes of a sham (placebo) ultrasound. The group receiving 15 minutes of 20 kHz ultrasound showed the greatest improvement, with all five patients experiencing complete healing by the fourth treatment. "We were surprised that the group receiving 45 minutes of treatment didn't achieve the same benefits as the 15 minute group, but sometimes we learn that more is not always better," said Joshua Samuels, a Ph.D. candidate and lead author of the study. "There may be a dosing effect." The team's clinical findings were corroborated by their in vitro studies in which mouse fibroblasts —cells that play an active role in wound healing—experienced on average a 32 percent increase in cell metabolism and a 40 percent increase in cell proliferation compared with control cells 24 hours after receiving 20 kHz ultrasound for 15 minutes. Lewin and colleagues said one of the greatest challenges of the study was designing and creating their battery-powered ultrasound patch. "Most ultrasound transducers require a large apparatus and need to be plugged into the wall. We wanted this to be fully wearable as well as portable, so we needed to make it battery-powered. To achieve that, we had had to design a transducer that could produce medically relevant energy levels using minimum voltage," said Lewin. Their resulting ultrasound patch weighs just 100 grams—the equivalent of a king sized candy bar—and is connected to two lithium ion batteries which are fully rechargeable. Lewin says the design gives patients the option of using the transducer in a home environment, while still wearing their compression socks. It also prevents the need for a doctor's visit, which can be a difficult task for patients with chronic wounds. "The wound healing technology described in this study is a particularly exciting ultrasound therapy application that holds great promise for future treatment of chronic wound patients," said Hector Lopez, Ph.D., NIBIB program director for Diagnostic and Therapeutic Ultrasound. "This is an excellent example of how NIBIB brings together the physical and life sciences to produce new technology that improves health." Lopez concluded by saying that before the new treatment would make it to a clinic, studies with larger numbers of patients are needed to confirm that the technology is both effective and safe to use. In the future, Lewin and Weingarten anticipate that patients with other types of chronic wounds such as diabetic or pressure ulcers may also benefit from therapeutic ultrasound. Because the ideal treatment frequency, duration, and intensity may be unique for each type of wound, Lewin and his colleagues have developed and are currently testing a diagnostic monitoring component of their ultrasound patch, which would help physicians optimize treatment for each patient. This monitoring component—developed with the help of Leonid Zubkov, D.Sc. of The School of Biomedical Engineering, Science and Health Systems, Drexel—uses near infrared spectroscopy (NIRS) to non-invasively assess changes in the wound bed that can reveal whether a treatment is working in its earliest stages, when healing is difficult to detect with the naked eye. "By monitoring subtle changes in tissue response as we deliver the ultrasound and immediately after, we can optimize the treatment for each patient," said Lewin. "Our goal is to develop a device that can be used on many different types of wounds for as long as needed without causing side effects. Once we have this universal applicator, we can use the near infrared spectroscopy to help customize the treatment to individual patients." A trial to test the NIRS component involving twenty patients is currently under way. The team is also hoping to learn more about why low frequency ultrasound promotes healing by expanding their in vitro studies. They are currently examining the effects of low-frequency ultrasound on macrophages—immune cells that play a critical role in wound healing—and on collagen production. "In wound healing, there is the inflammation phase, the proliferation phase, and the remodeling phase. We're looking at the primary cell participants at each phase and examining the effects of ultrasound on each of these individually and then collectively," said Samuels. A major contributor to this study was Dr. Elisabeth Papazoglou of the School of Biomedical Engineering, Drexel, who recently passed away.